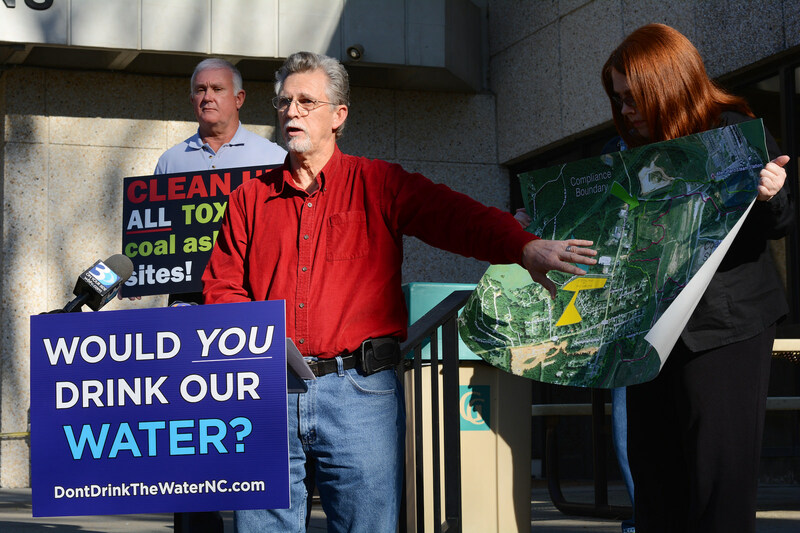 This blog is written on behalf of the Alliance of Carolinians Together Against Coal Ash (ACT Against Coal Ash), a statewide coalition of citizens and community organizations directly impacted by the North Carolina coal ash crisis. Last week, Charlotte-based news station WBTV released a slew of incriminating emails and documents revealing potential collusion between Duke Energy and University of North Carolina at Charlotte professors John Daniels and Bill Langley, who were supposedly conducting independent research regarding the safety of drinking water at homes near the utility’s coal ash ponds. These emails detail a process whereby Duke Energy provided what it called “strongly suggested edits” that downplayed the role of coal ash in groundwater contamination in those communities, providing Duke an avenue to avoid excavating coal ash from its leaking ash basins. “All of this just creates further concerns about Duke Energy’s honesty as well as how North Carolina is going to step up and respond to this information,” says Deborah Graham, who lives near the Buck Steam Station in Salisbury, N.C.
Daniels is the chair of the purportedly independent National Ash Management Advisory Board (NAMAB), which was created as part of Duke’s plea agreement on federal charges for environmental violations. NAMAB is meant to oversee the management of coal ash. As early as 2014, Daniels can be seen in an interview with UNC-Charlotte parroting the corporation’s claims of how Duke had recommitted itself to coal ash cleanup and had taken a leadership role in the national disposal of coal ash. These statements may have been a warning sign of Daniels’ cozy relationship with Duke. “Even though Duke Energy made a really big deal in 2015 and 2016 about how independent the board was, it is clear that the board’s findings and suggestions are actually coming from Duke. It appears the board is another Duke Energy board put in place to govern itself. It adds another level of distrust with citizens and our state which I didn’t think could get any lower,” Graham says. In its rebuttal, UNC-Charlotte also states that engineers are supposed to collaborate on projects, completely ignoring the fact that Duke has a vital interest in ensuring coal ash management laws and regulations incur the least economic impact to their company and its shareholders. UNC-Charlotte scientist Langley, who received more than $1 million in funding from Duke between 2013 and 2016, published a report modeling how different closure methods would affect groundwater at a coal ash pond in South Carolina. In this report, Duke’s suggested track edits include a sentence to say that a “hybrid cover in place” closure method would be the same as full excavation. If these engineers were holding true to their professional creed to safeguard public health, they wouldn’t accept that coal ash in the groundwater table could be considered secure or safe by leaving it where it could continue to migrate in groundwater and threaten nearby residents’ wells. “This is exactly why Duke Energy can not be trusted. The major core values of this company are lying, dirty tricks and cheating. I regret that the reputation of UNC-Charlotte has been tarnished and these research professors have fallen prey to the lure of Duke Energy’s deep pockets. Now we can add UNC-Charlotte to Duke’s list of recent purchases,” says Bobby Jones of Down East Coal Ash Coalition near the H.F. Lee Plant in Goldsboro. ACT Against Coal Ash is not surprised by the lengths Duke will go to in order to protect its bottom line and this collusion, despite Daniels and Langley’s objections and the university’s reassurances, is indicative of a larger issue which plagues North Carolina. Duke will invest its sizeable resources of political and economic capital to insure it is responsible for the least amount of coal ash cleanup. “There are people all across the state who live near Duke’s coal ash who continue to suffer from the toxic coal ash contamination in their water and air. Duke Energy, your efforts to hide the truth is life threatening to your neighbors! This is unacceptable and obscene!” says Cruz-Segarra.